I wanted to start this update with my favorite post of the week. I just love Tameri and if you haven’t visited her blog, here is your chance. Be Amazing with a Little Swagger – I read a quote recently that said “You control the way the world perceives you.” (It was Dr. Phil, but a good quote nonetheless), which is how I am going to approach returning to America in 17 days, 21 hours and 36 minutes, but’s whose counting. Not that I plan to create some persona that’s not me, but what I have learned most from my adventures in Asia is not be afraid to show people how cool, weird, happy, strange, passionate, funny, different and gorgeous (haha) I am. This article speaks to that and so much more. When the Going Got Tough, I kept Going. And it Worked! by Misha at My First Book – I am so proud of Misha. If you remember her post from last week: NaNo Doubts, it is so great to see her back on track. I was featured in not one, but two NaNoWriMo related interviews, check them out at Change the World with Words and Donna McNicol’s My Write Spot. Monday, November 19th – The Fitzroy – come check it out with me. Sunday – December 2nd – My Weekly Update – December is going to be fun. *I may do some random post if time permits, but my goal is to finish my NaNoWriMo (20,000 words) novel, finish my Camp NaNo novel (15,000 words) and then prepare for my big move. 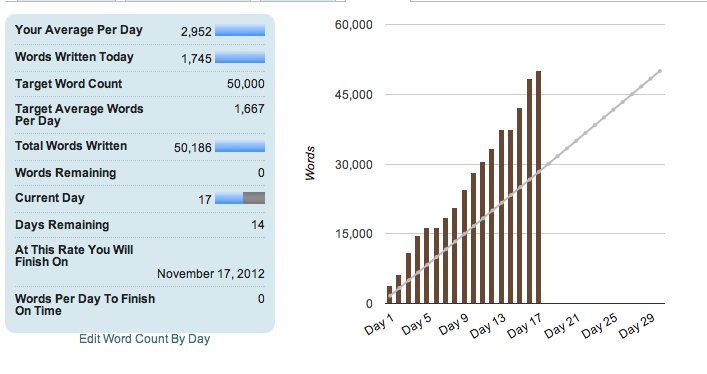 I would love to hear how everyone else is doing on NaNoWriMo. I want everyone to win. So, keep writing. I will be, too. Thanks Amanda. I love your post, had to share it. Happy Thanksgiving to you, too. Congratulations, you mind lending me some words? 😉 I’m currently sitting at 26,247. And, where have I been to miss the returning to America news? Hey Fel. Thanks. You still have plenty of time. 26k is great. I hinted at it on a Weekly Update a few weeks ago, remember the big climb photo, but this is the first time I have posted about it. Don’t worry, I now your healing, but you aren’t missing anything. haha. We’ll be delighted to have you back in the States!! Sooo proud of you for that fast NaNo win. Great job!! And thanks bunches for including me in your mashup. Squeeeee!! I am excited to return. I haven’t been in America for 2 years. It is going to be an adjustment. Thanks for the congrats. I worked hard on this one. haha. You rocked NaNo this year, that’s awesome Sydney! Congrats 🙂 Have a great week and happy thanksgiving! Congratulations! I hope to be joining you in the winner’s circle soon. Great post btw, I’m excited to check out some of your links. Whoa! Bad week for my computer to die. So sorry I wasn’t here earlier to THANK YOU for the huge shout out! And also to wish you many Congratulations on finishing NaNo ~ you did that in record speed! Congrats again on the NaNo win.